For the first time in a long while I’ve made a New Year’s Resolution, and it all started with our trip to the White Barn Inn in Kennebunkport. Our friends Mike and Craig took us there for a welcome back to New England dining extravaganza and it was amazing. Before our visit I was excited about the food, but worried I might not fit into either of my suit jackets (The White Barn Inn has a dress code). I left with tight pants, a satisfied smile, and a desire to dress like an adult. No hoodies in public for me in 2015. We’ve been back on the East Coast for a month and have already experienced plenty of snow. Our trip to The White Barn Inn was in the middle of an (albiet mild) storm. I’m usually a Nervous Nelly in poor weather, but Mike has a new Jeep and once we arrived the weather made for a perfect backdrop. The interior is amazing. For Five Star dining I expected at least a little stuffiness, but it just isn’t what the place is about. I should have known, it’s right there in the name. It really did used to be a barn. It’s definitely elegant now, but like a celebrity interview that leaves you thinking, “you know, that George Clooney is just an everyday guy.” We were orbited by at least 3 different servers, but I still felt like I was being entertained by friends. My favorite thing about Prix Fixe eating are all the little surprises. We were given a little amuse-bouche to start: a single house-made tortellini on a bed of finely diced peekytoe crab with a corn and red pepper sauce. I started with Pan Roast New England Quail Breast with Foie Gras Farce, Mushroom Ragout, Madeira Gel, and Cranberry Sauce. It stood out on the menu to me, but sometimes quail can adhere to its cute little bones and I didn’t want to get all down home Southern boy in a fancy place and have to eat with my hands. 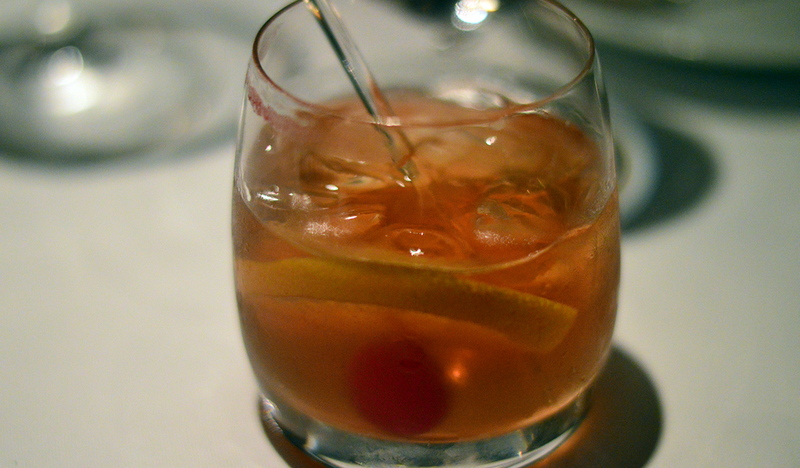 Our head waiter though named it as his favorite, so I went for it. It wound up being my favorite thing of the night. The tiny bird surrendered its tasty morsels without a fight. 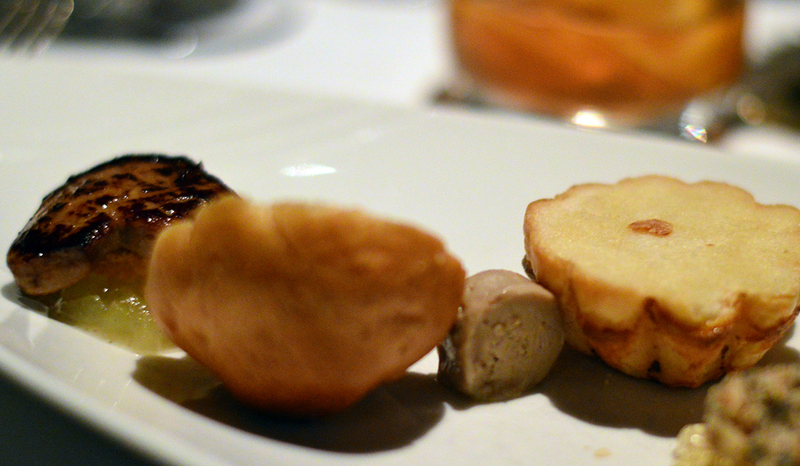 Molly had a Trio of Quebec Foie Gras; Seared on Apple Compote, Terrine and Praline with Sauternes Gelee. It came with a petite toasted brioche that was a nice surprise for us both. The signature element was as buttery rich as expected, but not at all overwhelming or heavy. Mike and Craig both got the Lobster Spring Roll with Carrot, Daikon Radish and Snow Pea in a Thai Inspired Spicy Sweet Sauce. I regret that I didn’t steal a bite, but it was early on and I was saving myself for the next courses. 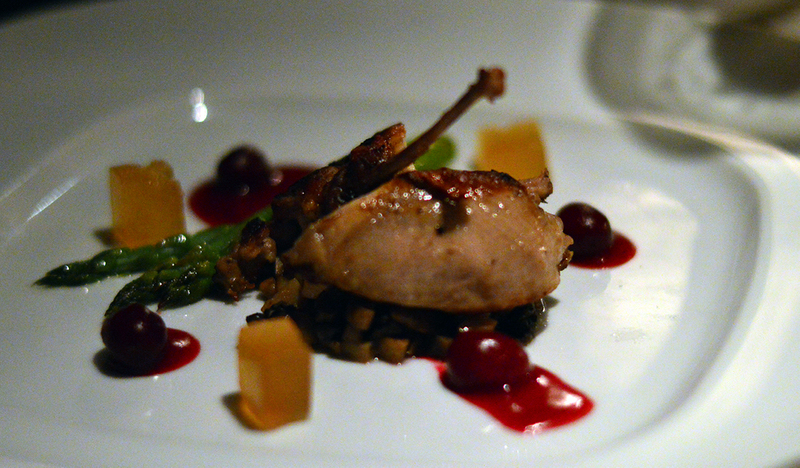 My next course was a close second place to the quail, although it didn’t photograph well. It was the Ragout of Braised Oxtail with Crispy Horseradish Potato. It looked like Beef Stew basically, but was bolder and more robust. The single square of horseradish tot was as center soft as it was crispy on the exterior, giving way like a good crème brûlée. It was delicious, but also thankfully modestly portioned. I was happy to share and still had plenty of steam for the Main Course. 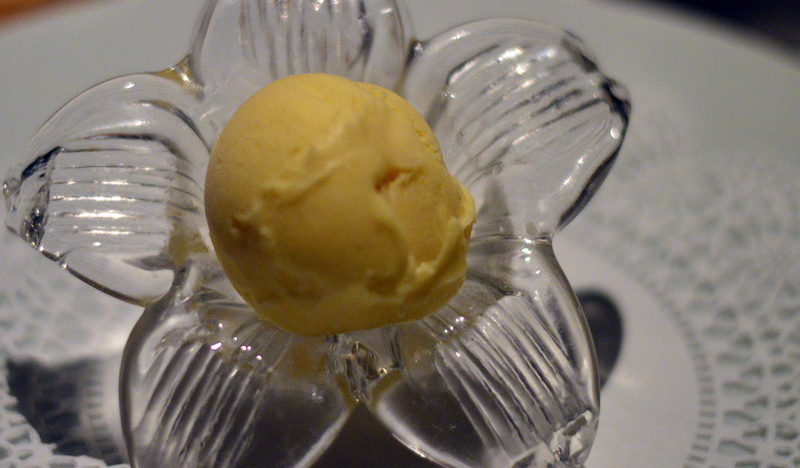 Molly went even lighter with the Sweet Corn Ice Cream, a simple and not overly sweet palette-cleansing pleaser. 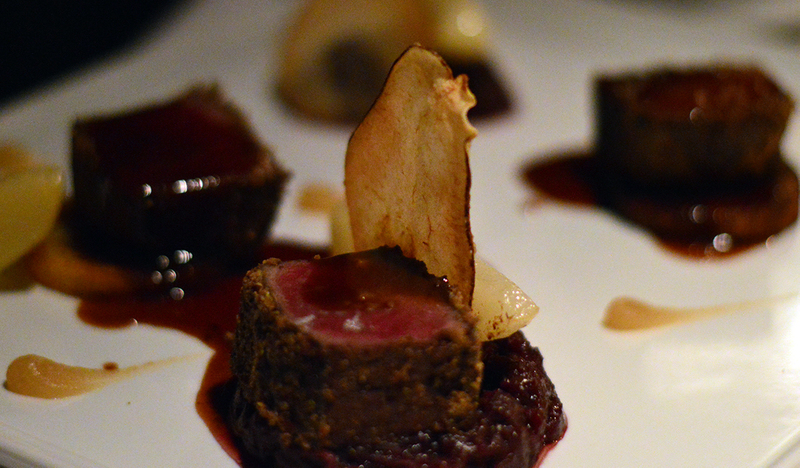 I went with another favorite of the head waiter’s, Seared Seed Crusted Venison Loin, Braised Red Cabbage, Bartlett Pear Purée and Poire William Cocoa Sauce. It was near perfect and would have missed any critique were it not for my stellar start. The pears were exemplary specimens, but I found them a little unadorned and neglected after the creativity of the similarly simple elements like the cranberry and potato of my first two courses. I had the same opinion about the bread. Both the pear and the house made bread seemed like a missed opportunity. They were good, but didn’t seem interested in greatness. They stood in the shadow of more talented siblings and were as invisible in the detail of memory as the silverware. Molly disagrees with my feelings on the bread. Molly’s choice for Mains was Seared Local Halibut with a Pecan Butter Glaze, Arugula Pureé, Tempura Cauliflower, Potato Pancake and Red Wine Shallot Gel. I would have been just as happy with hers as the Venison. 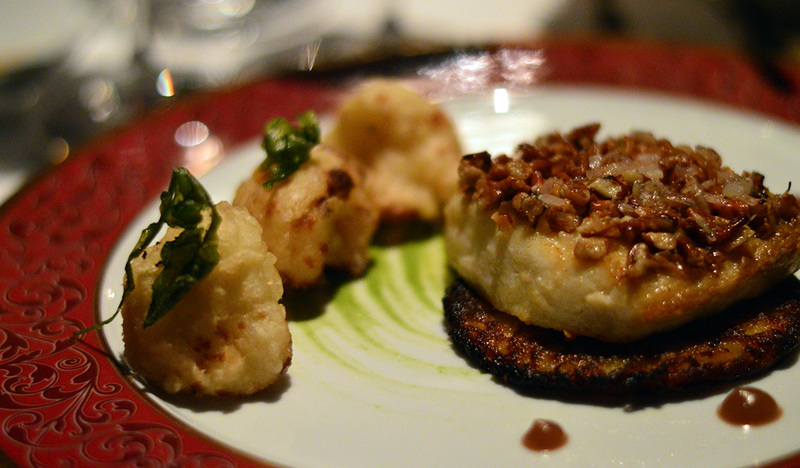 I was particularly impressed with the cauliflower, which rarely gets me excited even when battered and fried. It had the same sort of give as my horseradish potato and the same unlikely depth of flavor. The halibut was perfect and the light sprinkle of arugula was ever-present without being overbearing. I had plenty on my plate, but didn’t refuse several repeat tastings of the halibut. This was the only course that I would describe as over the top. We had a gratis “pre-dessert” (that’s a thing?) that was a generous dollop of chocolate mousse layered with a surprisingly nice pairing of fig jam. There’s a debate between Molly and me over the third layer. She remembers a second mousse and I remember salted caramel. It was not as dainty a portion as the amuse-bouche and wouldn’t have left me feeling cheated out of a course if that had been it. That wasn’t it though. We hadn’t officially started. In my opinion Mike won the dessert event hands down. 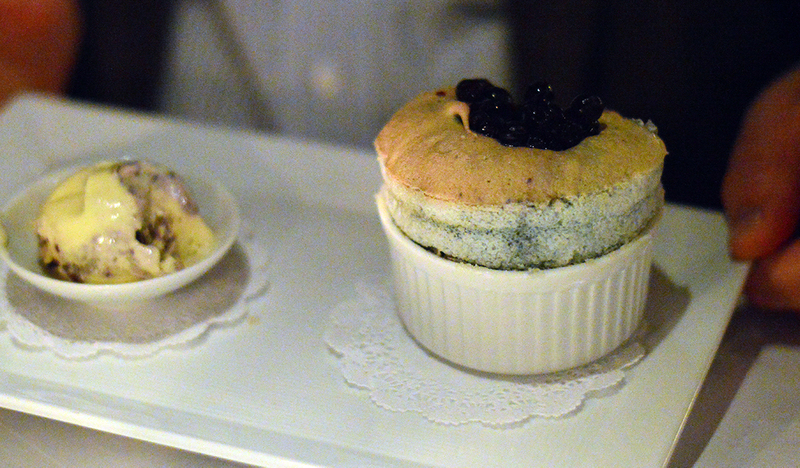 His Maine Blueberry Soufflé with Buttermilk Anglaise and “Blueberry Crisp” Ice Cream was flawless. It walked a razor’s edge of light and decadent without falling firmly in either camp. It was especially ideal after the heavy surprise round one of the sweets. I went against my better judgment and ordered the Gingerbread Layered Cheesecake, Cranberry Sauce and Sorbet with Sea Salt Brittle. I hoped it would be of the light and fluffy Italian variety, but was as doorstop heavy as the densest New York Style Cheesecake. Don’t get me wrong, it was absolutely delicious, but with everything that came before it I was defeated halfway through and couldn’t close the deal. Too much! Molly had an off-menu Crêpe Suzette Soufflé special that was a photo finish second place to the blueberry soufflé. I thought Craig’s Carrot Cake, White Chocolate “Flex”, Goat’s Milk Ice Cream, Candied Walnuts, Dehydrated Pineapple Tuille and Orange Meringue was also fantastic. It was just my own dessert that came on a little too strong for me. But wait, there’s more! With our coffee we were given a tiered tray of four “bite-sized” desserts that were all lovely, but not particularly light. There was a pecan tartlet that had all the gravity and weight of grandma’s pie, but also a jellied orange slice that was no sucker punch, it just really hit the spot. Just when we thought we were out, they pulled us back in! When the check rolled around we all got a orange chocolate chip muffin-cookie that, were it the beginning of a different evening in front of the TV, I could’ve eaten a dozen of without batting an eye and felt only pure glee. Molly and I had an incredible time and will definitely find an excuse to go back someday. The company, the decor, the service, and of course the food were all remarkable. Special thanks to our friends for the treat!